The 400 or 500 GPM front-mounted pump and other equipment on these "factory" fire trucks was installed by one of several fire apparatus manufacturers including Howe Fire Apparatus and General Fire Truck. 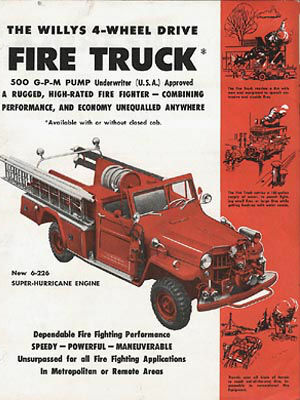 See More Jeep Fire Equipment Literature for a four-page brochure including specifications. 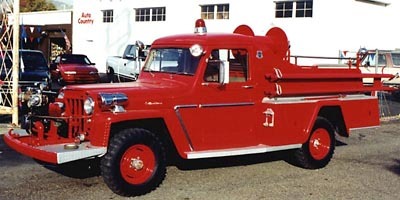 Willys also sold 4-wheel and 2-wheel-drive ambulance versions of the truck. 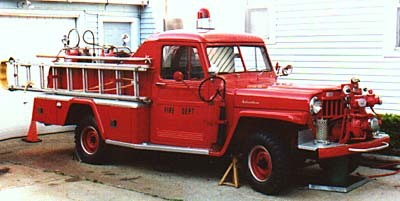 This hardtop Commando built by the General Fire Truck Co. of Detroit in 1954, served the city of Grandville, Michigan from 1955 until 1976. It now belongs to Gary Dreyer. The front mounted pump is a 500 GPM single stage Waterous unit. In 2006 Gary provided these details on repairing the pump: "Last summer I had the pump seal in my truck go bad. This seal was the mechanical seal behind the impeller, after searching I found that the original manufacturer had it available at a cost of $380.00, then I thought about it and figured that someone must make these seals for Waterous so I began the search and found that US Seal Manufacturing had the seal at a cost of $68.00. Over the last week I rebuilt my pump with the new seal and had the opportunity to draft with it today. It worked superbly -- it pulled a prime through one 10' suction in seconds. I plan to rebuild the discharge seals next fall to tighten up my pump." See more photos and details of the trucks from General Fire Truck Co. This very similar Commando, built by Howe in Anderson, Indiana, was photographed by Jolly Goodfellow in Utah. 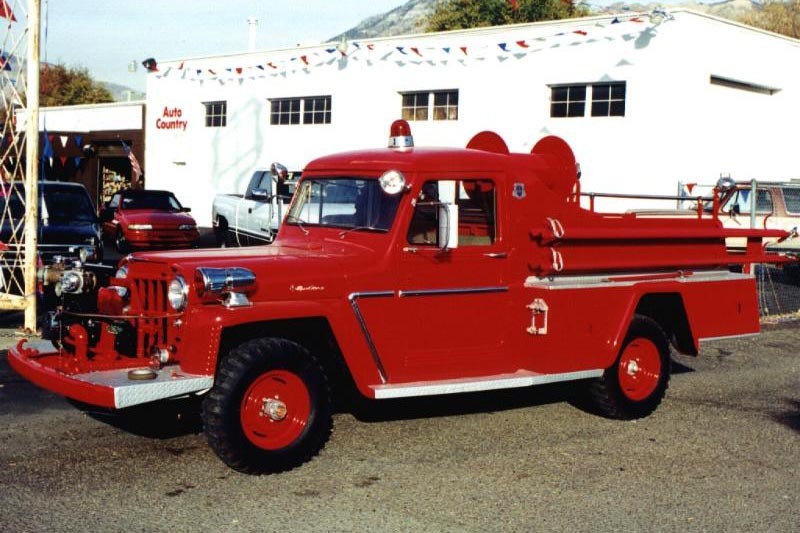 See more photos and details of Howe 6-226 Willys Fire Trucks and of Howe trucks in Yellowstone Park.